‘Little’ Movie Review – Spotlight Report "The Best Entertainment Website in Oz"
Thanks to Universal Pictures for the chance to see Little. This is our review of the movie, but as usual, no matter what we say, we still recommend you to go see it at your local cinema because there is no better critic than yourself! 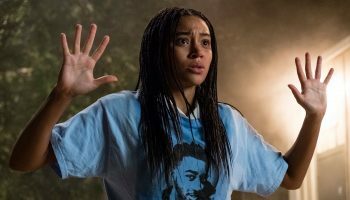 Little seems to be another grrrrl power movie, aimed at a young female audience. The script writing and plot is so tweeny in its technique as to be more aggravating than motivating. I wasn’t surprised to find that the idea for this film was pitched by its leading little lady, Marsai Martin. A few years after a ten-year-old Martin had seen Tom Hanks in Big, she forwarded her movie idea on a similar theme and it was snapped up. Incidentally, the youngest actor to have the role of executive producer, aged fourteen. But I’m not impressed by this. It may be historical but this so-called comedy is not hysterical. In fact, it’s categorised as ‘comedy fantasy’. The fantasy being that, overall, it was no comedy. Little works in the opposite direction of Big, whereby our protagonist wakes up younger and smaller, following a magical spell cast by an exasperated girl worn out by Jordan Sanders’ bossy ways. Jordan suffered bullying at school and decided to beat the bullies to their game first by always being the aggressor. In Little she’s a self-made, rich executive of a high-tech company with her staff, particularly her overworked and underappreciated assistant, April, under her killer heels and at her every beck and call. 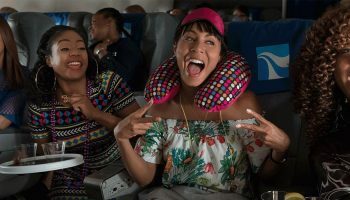 Amy, played by Issa Rae, does a good job of the sincere and hardworking employee, whose life revolves around that of her boss. April’s colleague, Preston (Tone Bell) is the kind word in her ear, praising her creativity (he has seen some sketched ideas and concepts of hers) and, later, her love interest. Jordan Sanders’ role, adopted by Reina Hall, is that of a ruthless magnate. Strangely, it’s Hall’s brief time on the screen at the beginning that lends Little its best moments. Hall barks abuse at everyone in her path but delivers the best lines in the movie. Once her role is replaced by the younger version of herself, we just have Martin being sassy, and not in a likeable way. The moment when little Jordan returns to school after being bullied at the canteen and made to sit with the other misfits (a juvenile department officer visits her home and stresses she must go; oddly, we never see this officer again) she sashays down the school corridor in a hideous 80s pink ‘power suit’ that reeks of Clueless and screams Barbie Doll attire. Instantly, her rivals admire her, now she’s well-dressed and aggressive. Hmmm. An eye candy bar is established in the forms of Mr. Mashall, Jordan Jnr’s teacher (Justin Hartley) and Isaac, Jordan’s hopeful boyfriend, Isaac- if she’ll let him get close enough- played by J.D. McCrary. I have no qualms with gratuitous flesh shown on the screen, but it goes against the grain of a film that’ supposed to be about chasing your dreams and using your inner strengths. Marshall and Isaac seem there to simply ogle. In fact, Little merely enforces the power of money good looks and equates following and flaunting fashion as a trademark of female success. When April ditches her cool trouser and sneakers look for her boss’ clothes, now they no longer fit her, she transforms from a funky person into a Whitney Houston lookalike. If Whiney used cheap prostitution, not singing, to pay for her crack habit. Also, when April finally has the courage to pitch her idea for a new app – Discoverise – it appears bland and clunky, not the innovative and instantly popular creation it purports to be. The soundtrack seems a collection of anything that should be blasted out of the pretentious type of sports car Jordan Sanders drives. One of the tracks, coincidentally (?) 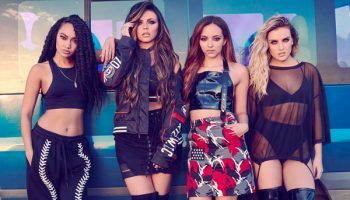 by Little Mix, called “Salute” gives an indication of the film’s direction: Don’t need ammunition, on a mission and we’ll hit you with the truth; divas, queens, we don’t need no man, salute. The music theme ensues with a school talent quest towards the film’s end. Jordan rushes to inspire her new pals to perform and what follows is a cringe-worthy, cheesy singing solo by her stuttering friend as she and the other nerds dance and grind behind him. I was tempted to use my empty popcorn bucket as a barf bag, at this point. Of course, the school kids in Little love it! Hooray! #grrrlpower, etcetera. I can’t help comparing this film to Big, namely because its star admitted to it being the inspiration. But Big had more funny moments as a comedy. And sentimental ones, too, that endeared you to its characters, such as a bigger Hanks singing his favourite lullaby to his mum over the phone. I’m not even a huge Hanks fan. Yet I was constantly irked by Jordan Jnr and Martin’s screen presence, in general. 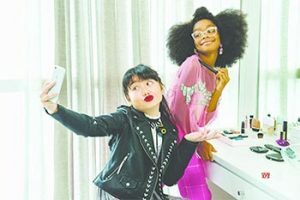 On her IMDb profile, Marsai Martin’s response to what she wants to be is, “I want to be a legend!”. After reading this my respect for this upcoming (and comeuppance, I hope) actor went from little to littler.